Chinese netizens fumed Thursday over a government ban on live coverage of Google algorithm AlphaGo's battle with the world's top Go player, as the programme clinched their three-match series in the ancient board game. 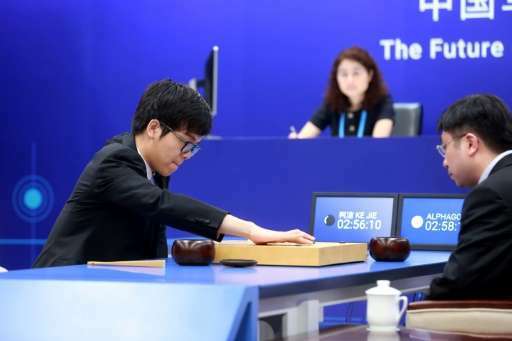 The artificial intelligence (AI) programme won its second straight match against 19-year-old Chinese world number one Ke Jie, who will try to salvage some pride for humanity in the third and final game on Saturday. This week's series in the eastern Chinese city of Wuzhen has been closely watched by futurists and Go fans curious over whether AlphaGo could beat the world's best, after making headlines last year by trouncing a South Korean grandmaster. But Chinese fans struggled to get information on the event after authorities banned live coverage, amid online speculation in China that it was linked to Google's tense history with Beijing. Google shut down its www.google.cn website in 2010 in a row over cyberattacks and Chinese censorship, and most of its offerings have remained blocked by authorities. That made for an awkward situation in the Go series, in which the company's corporate logos have been clearly visible on live stream broadcasts. This week's match-up received considerable attention in Chinese media in the run-up, but live coverage was abruptly banned shortly before the first match, according to a government directive to media outlets that was widely circulated online. The notice said the contests "may not be broadcast live in any form, without exception, including text commentary, photography, video streams, self-media accounts, etc." A Google spokesman could not immediately be reached for comment. Chinese fans denounced the ban. "I just lost my chance to witness such a historic moment. I feel so terrible," wrote one user on China's Twitter-like Weibo platform. Another user asked: "Has the political environment become so dangerous that covering something that has gained public attention has become impossible?" AlphaGo was developed by London-based AI company DeepMind Technologies, which Google acquired in 2014. Its win last year over South Korean grandmaster Lee Se-Dol marked the first time a computer programme had beaten a top player in a full contest and was hailed as a landmark for AI. Ke, who last year said he would never lose to a machine, accepted defeat after game one, calling AlphaGo a "Go god". For some, AI advances conjure sci-fi images of machines enslaving humanity. But for AI proponents, AlphaGo's feats have fuelled visions of AI that can not only perform mundane tasks, but potentially help mankind figure out some of the most complex scientific, technical and medical problems. Computer programmes have previously beaten humans in cerebral contests, starting with the victory by IBM's Deep Blue over chess grandmaster Garry Kasparov in 1997. But AlphaGo's success is considered the most significant yet for AI due to the complexity of Go, which has an incomputable number of move options and puts a premium on human-like "intuition". Go involves two players alternately laying black and white stones on a grid, seeking to seal off the most territory. AlphaGo's "thinking" is powered by millions of connections similar to neurons in the brain. It is partly self-taught, having played millions of games against itself. The Chinese government should be pleased. It can use the AI produced by Google to turn its citizens into complete zombies controlled by the state. Imagine the power of AI being used to predict any dissident behavior ahead of time, so violators can be liquidated before any rebellious thoughts even enter their mind! Now that's efficiency! Marxism must be eradicated, along with apologists in the West. Having actually played Go it's obvious to me that somehow the Chinese government has an investment in pretending that a computer cannot beat a human. Interesting speculations emerge about why this is. They are speculations about the Chinese government, not about the computer program. Teh stupid, it burnz. Ke Jie knew he was playing a game, and had chosen to do so. Neither of these things can be said of the AlphaGo algorithm. Such a device cannot be a primary source of danger - it has no volitions.